Incorporated February 23, 1990, Hoffman Electronics was established to: develop new products; write articles for publication and sell parts kits for the projects and products described in the articles; contract for writing technical patents; contract to design and build test equipment; design circuit boards and modules; general consulting engineering. The CONSULTANT section details some of the products and projects which I have designed and developed for many familiar companies. Currently, seven patents held or pending, are listed on page four. Hoffman Electronics Inc. was also designated by Microchip Technologies Inc. as a Third Party Consultant that provides hardware and software development for their family of PIC 8-bit micro-controllers. HEI has developed a substantial software library of application software and product development experience. Awarded Microchip Master’s Program degree, July 25, 1997. Received two patents on "DoorCom" Door Intercom System and are currently in discussions to license the product to potential manufacturers. Received patent on "Touchloc" Keyless Entry System. This lock system is pick-proof and offers simple installation, easy combination changes, and one button operation (except a combination is needed to enter). Currently are seeking licensing agreements for this product with several companies. 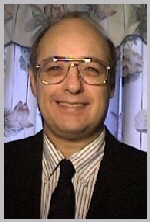 Honored by and listed in "Who's Who of American Inventors" 1996-1997; 1998-1999 for patented inventions. MAGNET INC - Designed a batch mix controller to automatically mix a 20 gallon batch of chemicals used in car washes. The controller determines the mixing resevoir is below a specified minimum level, then indicates a new batch needs to be mixed. when a new concentrate container is placed on the mixer, the controller locks the float mechanism, and turns on the inlet water valve. When the 20 gallon fill level is detected, the controller turns OFF the water inlet valve, unlocks the float mechanism and indicates the mixer is full. If an overflow condition is detected, the controller turns everything OFF and goes into a lockout mode that can only be overridden by turning OFF the power, inspecting the cause of overflow, then turning the power back ON. The complete documentation package included: schematic; BOM; PCB Gerber files; circuit operation; sequential step programming table; troubleshooting guide. The project was completed ahead of schedule and on budget. Seppo Rantala - Designed automatic cut-off for salt water aquarium pump used to clean coral. The unit runs off of lithium-polymer rechargable batteries. If they discharge below a critical threshold, they are destroyed. This unit turns OFF the pump when 20% of power is left in the batteries to prevent battery failure. The circuit needed to be very low cost, minimal size, immune to motor noise and very voltage accurate. Two versions were designed. The first version used a single ON/OFF push button switch that required a pulse start to activate the control circuit. The second version used two individual momentary push-button switches to either turn the pump ON or OFF. The circuits were designed, simulated, built, and verified. Project was completed on time and in budget. Logisync LLC. - Designed and built test fixture to test "Smart" power outlet module. Test Fixture was used to test production units. The test fixture provided outputs for calibration of current by test technician. The Unit was designed built and delivered in one week, on time and on budget. 1. AC line step down switching power supply capable of 12 V @ 150 mA output from 120/240 VAC line. 2. PIR Motion sensing circuit with pulse output. Sensitivity for up to 5 yards from sensor. output to the micro controller based A/D. These circuits were designed, simulated, prototyped and tested. Complete schematics, and BOM, were delivered to customer on time and on budget. CHANNEL PRODUCTS INC. - Wrote firmware for two microcontrollers used for a gas ignition controller. The unit utilized a 28-pin PIC 16LF873A microcontroller to perform all display and control functions. A second, 8-pin, PIC10F200 microcontroller functioned as watchdog time controller. The firmware provided for two line handshaking of opposite polarity signals when the timing of the two processors was within a +/- five percent tolerance band. The RTOS provided multiple output time flags for operating relays, annunciator LED's, and timing verification routines. Program checksum routines assured program integrity. Dual RAM variables for all critical parameters, with comparison checking, was used to verify error free RAM operation. Non-volatile lockout codes were displayed by blinking an LED. High speed code was piggy-backed onto the LED display to allow a hand-held reader or a Digital Oscilloscope to be used to read out a specific diagnostic code. The hand-held reader could provide additional trouble-shooting information. The inputs allowed for AC detection of switches when used with either 50 Hz or 60 Hz voltage sources. All AC and DC inputs were debounced using an 8-sample, multiplexed routine to assure stable noise immune operation. A Linear Sequential Step Control algorithm greatly simplified operation and debugging of the hardware and firmware. The entire project was accomplished in nine weeks. HOFFMAN ELECTRONICS INC. - Designed hardware and single chip controller for coffeemaker control module. The unit utilized a 28-pin PIC 16LF873A microcontroller to perform all display and control functions. The firmware provided multiplexed drive for a 4-common, 1/2 bias, 8-segment, 3 volt, LCD display. The firmware allowed for alpha numeric characters to be displayed to assist the user when programming the various features and functions of the coffeemaker. The RTOS (Real Time Operating System) provided for display multiplex rates of 50 Hz per digit and main control loop processing of 10 mSEC for multiplexed sampling of switches and inputs to assure stable noise free operation. Features include: 1- Four-digit LCD display with "AM", "PM", "BREW" indicators; 2- "AUTO" (YEL), "BREW" (GRN), "KEEP WARM" (RED) LED indicator lights; 3- Single Operation "SELECT" push-button, "AUTO", "BREW", "WARM", "OFF" sequence; HOUR, MINUTE, BREW time set push-buttons; 4- 0, 1, 2, or 4 hour selectable automatic shut-off. ( "SO:0H", or "SO:1H", "SO: 2H", or "SO:4H"); 5- Five Flavor Settings from Full pot ( "FP" weakest) to Half pot ( "HP" strongest) in "BREW" mode. ("FS:FP, FS: 1, FS: 2, FS: 3, FS:HP) (No DC amps due to diode rectification. ); 6- Selectable, AM-PM (12 hour) or 24 hour time format; 7- Variable "KEEP WARM LEVEL" of 0 to 10, ("HL:05"), 0 = room temperature, 10 = thermostat limit; 8- Blinking "KEEP WARM" light shows when coffeemaker needs cleaning; 9- Automatic Self-Cleaning cycle ("Cln" + ), with auto shut-off ("donE" + ); 10- Audible annunciator for mode select change; 11- Permanent EEPROM memory remembers all settings except for current time; 12- Connects to any existing coffee maker with a conventional thermostat, using a three wire hook-up; 13- Intelligent display shows settings as they are being set or changed; 14- Low cost, one-chip design; 15- Works with 50 Hz or 60 Hz line frequency. The complete hardware and software were developed, written, tested and debugged in 12 weeks. S-Tek, Inc. - Designed PIC16F876A based I2C interface board for a major computer company. The single chip, interface board operated a 16-character, x 2-line LCD module, status LED, and enabled 256 bytes of EEPROM R/W, flash memory storage, in the PIC. The interface to the motherboard was accomplished via an I2C connection. The PIC16F876A had a custom address to allow many other standard I2C components to be used on the same bus. Firmware allowed I2C codes to be sent that would write either function or CGRAM data, to the LCD module. The PIC wrote to the LCD module using a 7-line (3-control, 4-high/low nibble) interface. An adjustable contrast voltage pot was included to enhance the display contrast under varying temperature and supply voltage conditions. Other codes permitted the status LED to be "OFF", "ON", "SLOW BLINK", or "FAST BLINK", to indicate different status conditions of the server. The 256 bytes of EEPROM memory in the PIC could be written tp in 16 byte blocks, or read out from1 to all 256 bytes. This permitted storage of time stamps and diagnostic/fault data that could be accessed to troubleshoot the server. The project was completed in seven weeks, on time, and on budget. Audiopack Technologies, Inc. - Designed a Multi-Microphone Pre-amplifier Power Amplifier unit. The pre-amplifier needed to automatically detect whether a microphone was connected. Additionally, it had to detect the three types of microphones connected and select the appropriate gain for each type of microphone so that a half volt output signal was obtained for a reference input signal. The power amplifier is a class "D" type that allows for a maximum 1 watt output at more than 90% efficiency into an 8 ohm speaker with only a three volt battery. The entire prototype unit was laid out on a double-sided, 1.5" x 2.5" PCB. It used four IC's. The project used the latest components, circuit topology and design methods to achieve high efficiency, performance and minimum cost. The unit came in on time and on budget in 15 days. 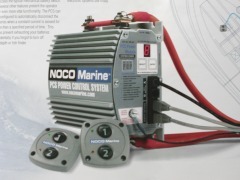 HICKOK INCORPORATED - Wrote complete firmware for Marine Power Control System. 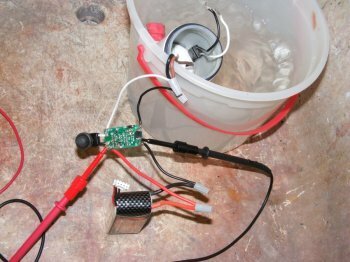 The unit utilized a PIC 16F877 microcontroller to perform all measurement and control functions for operating a two battery power system for boats and marine craft. Multiple averaged sampling was used to provide stable voltage and current readings for both batteries. The RTOS (Real Time Operating System) provided for multiple time multiplexed sampling of switches and inputs to assure stable operation. Each half second an NMEA (National Marine Electronics Association) data stream was sent out via an RS-485 port at a 38.4 K baud rate. The stream contained battery voltages, charging currents, trickle charge duty cycle percent, configuration settings and relay status. The system provided for SMART START which would automatically engage the second battery to assist in engine starting provided that it was properly charged. If batteries went too low while the engine was off, they were disconnected automatically from the load. If cross charging is excessive while both batteries are on line, the bad battery is taken off line. Many other operating and safety protection features were included. The complete software was developed, written, tested and debugged in 10 weeks. Stargate Q Corp. - Designed a prototype hand-held gas detector for military use to detect hazardous nerve agent, poisonous, and blister contact agents. 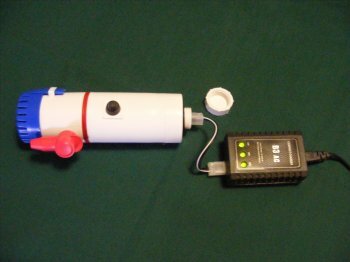 The device used an optical reader and diaphragm pump to sample environmental air. A 16-character x 2-line LCD module provided a menu driven selection and operation format. The transflective LCD module allowed the display to operate in a backlit (when dark), or direct sunlight reflective mode. After the user selected the gas to be detected, they were instructed to insert the correct chemical chip card into the reader. Next, the user would actuate a knob to break the ends of the glass sample tubes. The diaphragm pump would run and pump a defined size sample of air through the the sample tube. An optical reader looked for a change of color to determine the amount of hazardous gas in the sampled air. A single 28-pin PIC16F876A provided all control and A/D functions for the unit. The program memory look-up table contained all of the menu screens needed for operation. Power management features included: automatic backlight shut-off, 30 seconds after the last action was performed; Automatic unit shut-off, 20 seconds after test is completed, or after 60 seconds of inactivity. The PIC also controlled the LCD module contrast in eight steps. The EEPROM in the PIC micro-controller held all the device settings and calibrations that allowed the device to recall the last gas tested after a power down. In-Circuit Serial Programming was built in to allow firmware upgrades and test modifications to be made. HOFFMAN ELECTRONICS INC. - Designed the Digital Light & Sign Controller with 24 pre-programmed lighting effects. The unit can create 2 of 4 lights-in-motion, three and four panel inline arrow animation, three and four panel oscillatory (flapping wing) animation, ramp brightness lighting effects, 0% to 100% dimming, and many more. The unit uses a single PIC micro controller to control four triacs. Each triac can control up to 200 miniature Christmas lights, 35 count C-7 lamp string, 25 count C-9 lamp string, or 2 - 75 Watt flood lamps per triac channel. The mode, animation speed, and brightness are selected using only four push buttons. After programming is complete, the unit waits one minute and then stores all of the settings permanently in non-volatile EEPROM memory. When the unit is turned on, the settings are retrieved from permanent memory and the unit executes the display settings which it was last taught. The design utilizes minimum parts and advanced packaging to achieve a low product cost. RTI Technologies, Inc. - Designed from concept through production, a dual port RS-232C serial interface to communicate with a Freon identifier unit and a Citizen 40 column serial printer. The firmware used a single USART in the PIC16C67 micro controller and a 74HC126 CMOS switch to select either the printer or the Freon identifier as the device to communicate with. A Maxim 202E was used to translate from logic to RS-232C levels. The firmware allowed 9600 baud serial rate and preformatted the text being sent to the printer to read out the amount of Freon recycled, charged, duct temperature, Freon type, percentage of Freon mixture components, date, technician ID, and so forth. Algorithms to process data from the Freon identifier were developed. Each serial port cost $1.50. The project was completed in 10 weeks with schematics, complete firmware documentation, and debugged, working prototypes. RTI Technologies, Inc. - Designed from concept through production, a menu-driven, intelligent, machine controller for the model RHS2780 Recycling machine used for automotive A/C service. The controller has a 2-line by 16-character LCD display which guides the service technician through a parameter selection menu, then runs the complete recycle, vacuum, charge sequence automatically. The software supports complete setup and calibration using no adjustment pots. All calibration constants, setting variables and user variables, are stored in non-volatile memory. They are used as defaults for the next subsequent cycle and are retained even if the machine is disconnected from it's power source. The program used multiplexed, step control methods and advanced real-time system techniques to minimize program memory requirements to less than 4K words. The controller runs two separate recycling systems. One is for R-12 type freon and the other is for R-134A type freon. The project expanded the controls used on the RHS780 and combined control functions to produce a dual control unit costing only 30% more than a single unit. The project included the following items: hardware design; schematic diagram; PCB layout; system software/firmware; system debug; complete documentation. It was completed in 12 weeks, on time and on budget. 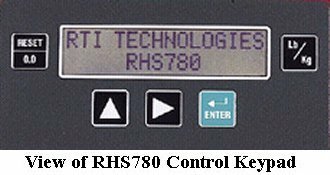 RTI Technologies, Inc. - Designed from concept through production, a menu-driven, intelligent, machine controller for the model RHS780 Recycling machine used for automotive A/C service. The controller has a 2-line by 16-character LCD display which guides the service technician through a parameter selection menu, then runs the complete recycle, vacuum, charge sequence automatically. The software supports complete setup and calibration using no adjustment pots. All calibration constants, setting variables and user variables, are stored in non-volatile memory. They are used as defaults for the next subsequent cycle and are retained even if the machine is disconnected from it's power source. The program used multiplexed, step control methods and advanced real-time system techniques to minimize program memory requirements to less than 4K words. The controller costs less than 10% of the cost of a programmable controller used to run the proof-of-concept unit. The project included the following items: hardware design; schematic diagram; PCB layout; system software/firmware; system debug; complete documentation. It was completed in 16 weeks, on time and on budget. AudioPack Sound Systems, Inc. - Designed intelligent VOX switcher used in HAZMAT and Firefighter masks and/or helmets. A PIC 12C508 monitored four inputs including: helmet mic; receiver audio in; push-to-talk switch; operating mode switch. It used software debounce on input lines, and would allow switchover between receive and transmit only after the proper threshold detector, or switch input, was "off" for a programmable period of time. This provided parlimentary arbitration of the communication links between the fire chief or group leader and the teams of personnel working the situation site. The design achieved desired function using minimal parts and low production cost. The project was completed in about two weeks, on time and within budget. InSource Technologies Inc. - Designed HVAC Scale/Charging units used for weighing and dispensing Freon into HVAC systems. The unit reduced the control board production cost from nearly $100/unit, to $28/unit. The control board is approximately 3" by 6" and incorporates a 1line by 16 character LCD dot matrix display. An 18 pin, PIC 16C558 microcontroller used I2C, two wire, serial link to communicate with EEPROM memory which stores all of the calibration and operational variables. It used a three wire, serial protocol to communicate with a 16 bit, serial output, sigma delta A/D convertor. It used the standard 7 wire, 4-bit interface to send the ASCII information to the LCD for readouts. To accomplish reading the six input switches, the LCD control lines were switched to inputs, read, debounced and evaluated. The program included 16 and 32 bit integer math, scaling, auto-calibrate, and all functional controls and fit in 2K bytes of program memory in the PIC. The project included the following items: PCB layout; hardware; firmware; system debug; complete documentation. It was completed in 10 weeks, on time and on budget. Yuasa/Exide - Designed General Series Battery Charger Control Module used to operate and control General Series lead-acid battery chargers ranging in size from 50 to 500 amps charging rate, and 120 VAC single-phase to 460 VAC three-phase. The control circuit used a PIC 16C74A microcontroller. 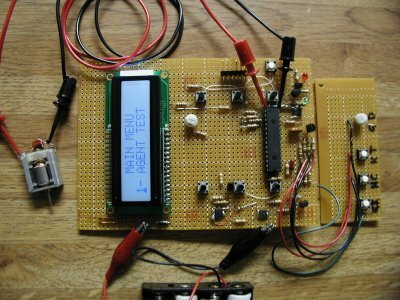 The project started with a functional specification and required design of all analog and digital circuits, all micro-controller and EEPROM memory, writing all firmware for basic and enhanced models. The design was implemented using a single P.C. board and only four IC’s. The cost savings per unit were greater than one-hundred dollars and provided equivalent features found on their higher end chargers. All critical control flags and data were stored in permanent EEPROM memory via an I2C serial bus. Firmware calculated volts-per-cell, charging amps, amp-hours of charge, elapsed charge time, and allowed real-time display of data. Software debouncing of all switch inputs, real-time averaging of volts-per-cell and charging amps, complete system calibration, permanent storage of display mode and shut-off method, were provided in firmware. Both projects were completed in five months. Yuasa/Exide - Wrote Firmware for PIC 16C74 micro-controller used in a battery I.D. module. The unit communicated to the connected truck or battery charger over the battery cables, at 300 baud, using C2SI (current carrier serial interface). Modules used A/D to monitor battery voltage, temperature. Modules recorded up to 16 time-stamped event logs in EEPROM memory. Communication with the real-time clock chip and the EEPROM was accomplished using I2C bus communication protocols at 100k baud. Designed front-end voltage level protection switch to enable module operation when input voltage was within specified range. Designed temperature sensor interface amplifier to provide gain, offset, and non-loaded input to the A/D converter. SEG Design - Designed electronic control module for 12 volt coffeemaker. Unit is intended for automotive, R.V., boat and truck market. The unit utilizes electronic, NTC thermistor sensing. It switches accurately over wide range of system voltages. Design is low cost and provides for easy installation. Design provided: specifications; schematics; PCB layouts; BOM; operating prototype modules. Project completion time 7 days. INVACARE CORPORATION - Designed an ultrasonic product flow sensor to detect the percentage of oxygen present in the output flow of an oxygen concentrator unit. The unit measured the difference in time, for an 8 cycle, 40 KHz pulse burst of ultrasonic sound, to travel through the product gas flow mixture and calculated the percentage of oxygen in the product gas based on the time difference. The sensor automatically calibrates itself and stores the calibration values in EEPROM memory. The completed sensor utilized an 8-pin dual op-amp and an 18 pin PIC 16C84 micro-controller. The previous design cost $150, the current design costs less than $30. Annual product cost savings will be greater than $12 million. The design package provided customer with: applied mathematic formulas; schematics; PCB layouts; operating prototype hardware; complete prototype software (full auto-calibration built in); BOM. Project completion time 4 mos. LUMITEX, INC. - Designed "Laser Tag" modules with 45' range. Modules fit in 1.75"L x 1.25"W x 0.5"H oval shaped housings. Receiver included flashing LED and beeper which were activated when module was hit with 40KHz I.R. beam from the transmitter module. Combined product cost of both modules was held to $3.50. Modules were to be placed on L.A. Gear "TECH" series shoes. Provided: schematics, PCB layouts, BOM, working proto-type engineering sample modules. LUMITEX, INC. - Designed a P.C. based, 2-axis, lamp positioner. The unit would move the lamp in two axes until light output was greater than a specified minimum and panel streaking was less than a specified limit. If the light output parameters did not meet specs, the part was rejected. If the part was okay, the unit would then apply UV curable epoxy and apply UV radiation for 15 seconds to cure the resin. The operator was prompted to remove the part, the unit would then find "home" and prompt the operator to load the next assembly. Designed the stepper drives, the stepper control software and wrote the entire system software in Q-basic. The control program was formatted on sequential step control basis to simplify trouble-shooting and minimize down-time. LUMITEX, INC. - Designed an Optical Test Fixture Data Acquisition System. The system was PC based using an ACCESS 8-channel, 12-bit A/D card, a photo-voltaic light sensor, a current to voltage front end amplifier, four HEXFET output drivers, and three logic inputs. Wrote the acquisition software in MS-DOS Quick-Basic. The software featured: signal averaging; absolute minimum and relative percent high/low acceptance limits; file archiving with date/time stamp after every 100 samples; three decade input level auto- ranging. Each channel's lux, gain, range, a/d bits, and pass/fail criteria were displayed. Actron Manufacturing Co. - Designed micro-controller hardware and firmware used to send data to a R.F. frequency synthesizer phase- locked-loop. The micro-controller read a sixteen position hex encoded switch. It looked up the correct six bytes of channel data and transmitted it to the synthesizer PLL via an "I^2C" ( I squared C), two wire serial link. The micro-controller then went to sleep to conserve battery power until the next channel change command or power-up sequence was initiated. CHANNEL PRODUCTS INC. - Designed Recreational Vehicle Furnace control. Unit featured 8-bit RISC micro-controller, high voltage oscillator/spark generator, fan and gas valve control relays, and diagnostic LED output status indicator LED. Wrote all software including: real-time operating system; digital filtered input status buffer; lockout LED indicator with embedded high speed diagnostic codes; total power-up system diagnostics and self-test. The project was completed in 12 weeks per contractual agreement. Customer received: schematics; BOM; confirmation of board layouts; compartmented source code with full operation annotation and cross-assembler listing; executable object code; WordPerfect printable source and list code files; complete functioning alpha proto- type unit. DFA Corporation - Designed 8-bit micro-controller for random message playback from ISD1020A sound chip. Unit was to wake up from sleep on command, generate four random numbers, and control sound playback. Sound chip contained 1 to 20 messages. The software selected the starting address of first message, random message increment, number of messages played back, time between messages played back. Designed hardware, wrote software, furnished customer with programmed micro-controllers, schematics, fully annotated source code, source code listing, and object code. Project completed in two weeks as per agreement. LUMITEX, INC. - Designed Medical Product from customer wish list for treating "Seasonal Affective Sleep Disorder". Completed unit featured 8 bit RISC micro-controller, 12-button X-Y keypad, quad-seven-segment LED display, LCD clock unit, and HEXFET PWM lamp power controller. Designed all circuitry and printed circuit board. Wrote all software including: 16-bit integer math routines; real-time operating system kernel; PWM software duty cycle routine; 3 by 4 keypad decode with last digit rollover; right-to- left digit scroll display routine. The project was completed in 8 weeks, ahead of schedule and under budget. Picker International Inc. - Designed Pulse Width Modulated (PWM) Servo Motor Controllers for the Radiography/Fluoroscopy X-ray Group. Controllers interface to a micro-controller via a 12 bit serial DAC to position components in the filmer and table. Designed analog position servo circuit with totally independent adjustable gain, offset, deadband, span, and pole/zero cancellation circuit. Designed PWM power output modules to run permanent magnet D.C. motor sizes ranged up to 10 HP. 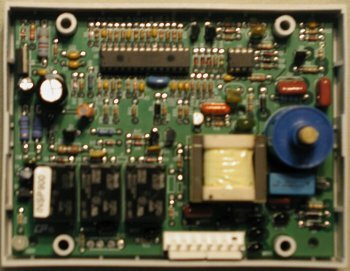 High power output modules used IGBT's in a switching, four quadrant, inductance energy dissipation (both low-side drivers ON), and charge pump power supply. Designed force sensing resistor power assist handle and vector wobble plate actuator for operating the filmer and table top. The designed interface electronics with adjustable dead-band, offset, gain and slew rate limited ramp control. Designed pin diode transconductance fiber optic amplifier interface for 1 Mhz baud rate, full duplex serial communications using low cost plastic fiber and PIC 16C54 u-Processor. 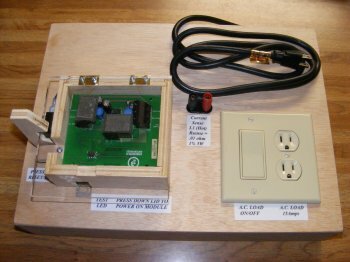 AdobeAir Inc. - Designed Electronic, u-processor based, heater control with advanced features including: tip-over lockout; line or neutral short-circuit lockout; ultrasonic object detector shutoff; thermistor assurance safety lockout; over-temperature safety lockout and grill touch shutoff. Wrote complete annotated assembler code. Provided PCB design, complete design documentation, module manufacture sources, functioning prototype modules, and technical explanations for U.L. and patent application. Specified, tested, and approved all electronic controls, switches, components and circuits. Provided advanced control features at a specified price point. Designed two custom Application Specific Integrated Circuits. These custom ASIC's used bipolar and CMOS technology on the same substrate in a 15 to 17 mask layer process. They incorporated both analog and digital control circuitry including: a multi-input state machine controller; multi-level, differential bridge comparator; current limited bipolar output drivers for direct LED drivers and short-circuit protected relay drivers; zero-crossing, adjustable phase triac driver; self-test lock out circuitry; fast response shunt regulator. Control circuits were designed, prototyped, tested and verified prior to ASIC implementation. The ASIC's were qualified to verify compliance with design specifications. Circuit board layouts were completed for compliance with U.L., CSA, VDE, and MITI standards. Other products designs include: automatic shut-off for mug and decanter warmers (patented); differential ion meter for water filter (patented); Expert coffeemaker control (patented); automatic shut-off with 2-6 CUP electronic- small-batch control; second generation coffeemaker control (patented); magnetic-interlock, auto-shut-off (patented). Worked closely with marketing, sales, manufacturing, and quality control to: incorporate new features into new and existing products; assure vendor performance and quality; correct defects in products due to design or production methods; reduce line test time. Became very familiar with aspects of plastic injection molding, including: tolerances; finish; part draft; cycle time; mold cooling; part shrink and warpage; part sag; mold lifters; structural supports; material requirements for safety approvals (FDA, U.L., etc.). Learned metal stamping (progressive dies) and wire forming methods and techniques. This position required self-starter and highly motivated individual to conceive and implement projects and programs for product development. It was also necessary to communicate well in written and oral form. Worked with sales and marketing, and made presentations to the Board of Directors. Wrote three patents for my inventions and worked with legal counsel in both the patent area and with regard to product liability. These products sold more than $40 million and are still being produced and sold. Administrative/management functions: quotation and proposal writing, concept and sales discussions with clients; established schedules and procedures for new product development; developed new product concepts using applied physics and mathematics; established engineering documentation standards for hardware and software development; interviewed and hired engineers and tech nicians; evaluated personnel performance; made salary recommendations for engineers and technicians; made capital budgets for personnel, equipment and department. Engineering background includes: A/D and D/A conversion; small signal and power output, linear amplifiers; analog signal processing; F/V and V/F conversion; duty cycle to voltage conversion; time/period to voltage conversion; phase-locked-loop applications; digital logic; signal mixing and multiplexing; microprocessor controls; waveform simulation and generation; power conversion and isolation; AM, FM, and PWM modulation; shift register and state machine controller logic; PLC system programming; programming in BASIC, some "C", some ASSEMBLER, FORTRAN, DOS. Additional duties: calibration, signal synthesis, and production test equipment design; writing calibration and acceptance test procedures; writing instruction and operating manuals; establishing equipment compliance with appropriate industry, U.L., ANSI, IEEE, NEC, VDE, and customer standards. Two direct reports; established electrical control standards; devised master drawing files; wrote personnel training program; established software programming and documentation standards; wrote job descriptions and performance reviews. Project duties: designed complete control systems from initial concept through final on-line debug and operation; wrote control software and system documentation; specified all system hardware, sensors, PLC's and interfacing system hardware/software; designed special controls, circuits, and measurement circuitry for project/system development. DUTIES: Heating Systems Specialist, OJT Instructor, NCO Leadership Class Instructor. Health: excellent, Hobbies: swimming, music, tennis, hiking.